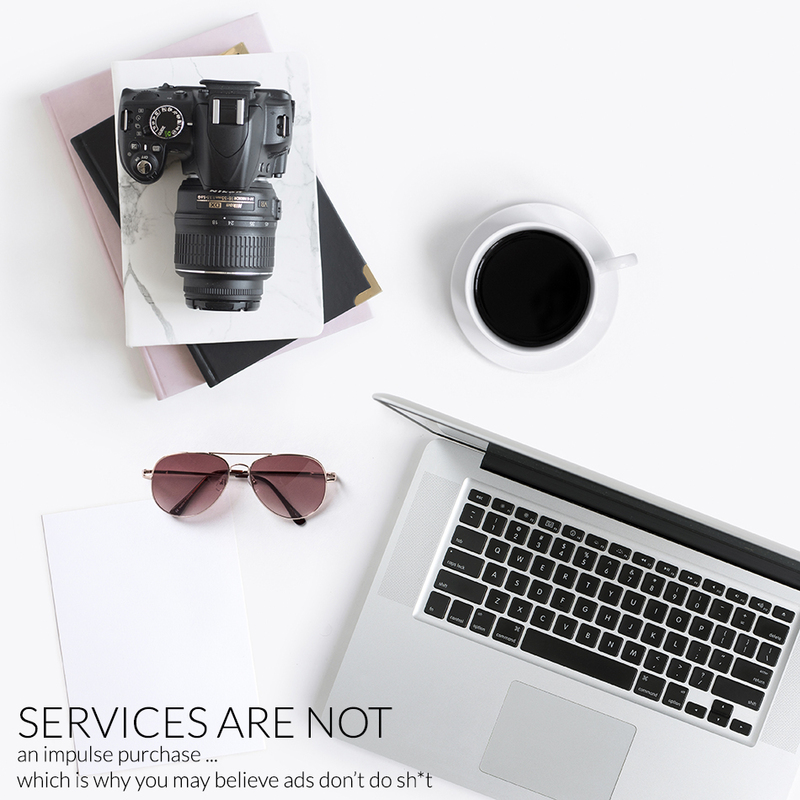 Services Are Generally Not An Impulse Purchase, Which May Be Why You Hate Advertising So Much! None of us know the true impact of what a publication adds to our business until it's gone ... and I think a lot of people believe they should constantly be feeling the SUPPORT that ads and features add to grow success ... but that's just not true. it's not a 'see it, hire it' process! Yeah, it is ... money from ads ... and if the publications don't get money, then they close ... and then all the features you want to have to get the word out about your service ... welp, they end. Services, especially services for weddings are NOT AN IMPULSE BUY ... when I was planning my wedding I bought every magazine that Barnes and Noble (yep, I got married a long time ago ...) sold ... I paged through them each multiple times ... I made notes ... some of the magazines got recycled, so I reverted back to my notes ... I spoke to friends, I Google'd some sh*t ... I looked at more magazines ... and while I'm sure I took in LOADS OF ADS and they probably led me down the 'road to hire' I can guarantee you that I wouldn't have remembered where I first heard about the companies I ended up hiring. I know that a lot of people these days get found on Instagram ... but how did they find your Instagram account in the first place? Was it linked from your website that was linked from a blog? Was it tagged in a post from a blog who is promoting you as an advertiser? No, Heather ... it was tagged in a post promoting the feature that I got for free from a publication. So, there!!! I realize I sound like a broken record on this blog, but as a former wedding blog editor and creator it makes me sad and worried to see the world of publications coming to an end in so many ways ... I know they are a vital part of the wedding industry wheel that keeps everything turning ... and you can form relationships with editors, which you can't do with Instagram or Facebook ... heck, none of us even own the social media platforms where we spend all our time! I would much rather grow and build a relationship with a publication or two or three where I have a voice, can get features, hold my ad, and have some control over what the future holds. Stop Hoping For A Return On Investment That Is Directly and Only Related To One Thing: It Rarely Exists!! !